Today’s guest post by Daniel Hertz was originally published on City Observatory. It is republished here with permission. One of our favorite think tanks, City Observatory, regularly publishes nuanced deep-dives into the patterns of development, economic and demographic trends in America’s urban areas. And they’re quick to point out where others’ analyses fall short or misrepresent what is truly happening. This post, which is full of goodies for the data wonks in the crowd, addresses a favorite theme of theirs: how generalizations about “cities” versus “suburbs” are often based on broad-brush categorizations that fail to reflect the complexity of what’s really going on in either type of place. Too often, the descriptions of urban form are reduced to excessively simple binary classifications (city v. suburb), or rely on data grouped by counties, which are maddeningly disparate units. County-level population data is bad at telling us much of anything about cities and housing preferences. Counties just contain too many multitudes—of built environments, of types of neighborhoods, of zoning regimes—and vary too much from place to place to be very useful in cross-metro comparisons. 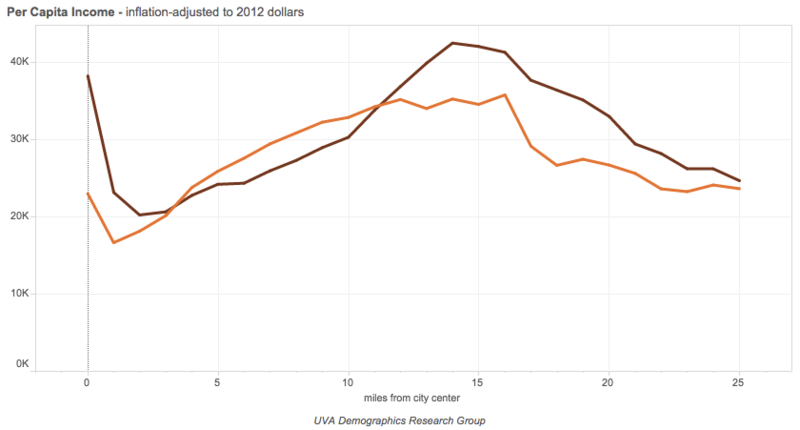 The brown line shows the data from 2012; just as dramatically, the orange line shows the data from 1990, back when American cities followed the “old donut” model: a poor inner city and wealthy suburbs. What’s so valuable about this presentation of metropolitan data—as opposed to county, or even municipal, based analysis—is that it doesn’t require the historical accidents that are government boundaries to correspond with subtle and ever-changing social and economic geography. By simply showing what happens to, say, the proportion of residents living under the poverty line as we move mile by mile through a metropolitan area, we get a much better sense of a region’s shape than we do by drawing a handful of sharp lines and measuring how many people fall on one side, and how many on the other. In other words, it’s mostly single family homes. But it’s also centrally located, and, in the Memphis area, is popular specifically for its centrality, relative density and walkability, and other “urban” amenities. Kolko’s criteria, though they sound perfectly reasonable at first blush, mischaracterize the role Midtown plays in Memphis—and the role that many other similar neighborhoods play in their regions across the country. Juday’s charts, on the other hand, easily register Midtown’s popularity among the young and well-educated as a close-in neighborhood.